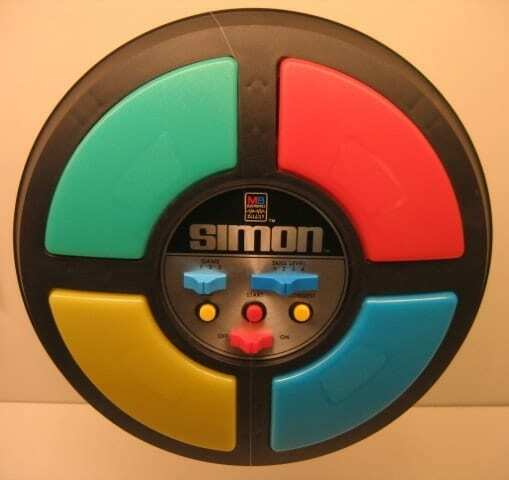 Simon is a memory game introduced in 1978. It has four coloured buttons, each producing a particular tone when it is pressed or activated by the device. A round in the game consists of the device lighting up one or more buttons in a random order, after which the player must reproduce that order by pressing the buttons. 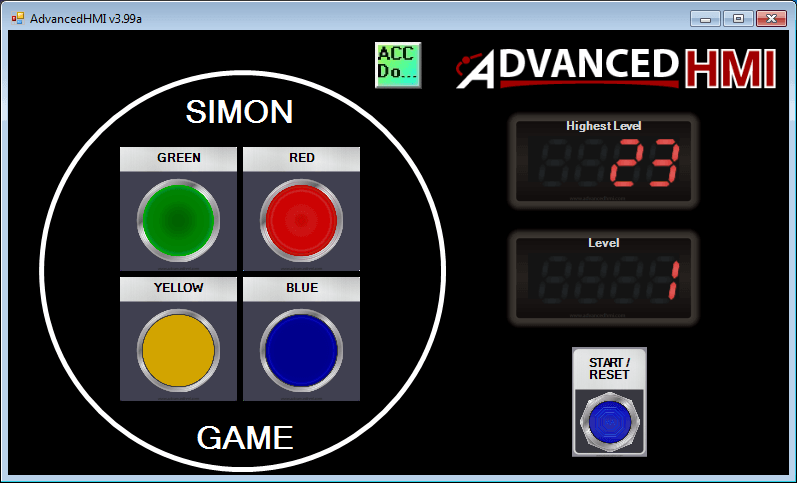 As the game progresses, the number of buttons to be pressed increases. If the wrong button is hit the current game is over. Our game will have a high level score and a current level score. 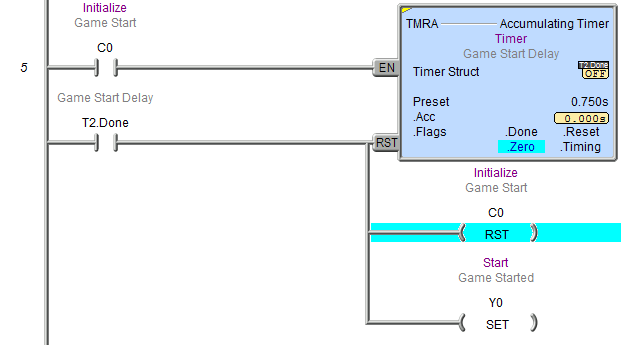 We will be using AdvancedHMI to communicate Modbus TCP to the Automation Direct Do-More Designer Software Simulator. Here is the end result of our program. Note: The programs are provided free of charge and are an excellent way to learn PLC / HMI programming. Here is a quick review of the programming series so far. If you are new to the site, we recommend reviewing the other parts in the series first. In part 1 we looked at writing PLC programs to control a traffic light using discrete bits and then using timed sequencing using indirect addressing. Part 2 used indirect addressing for inputs as well as output to control the sequence of pneumatic (air) cylinders in the program. Part 3 and 4 we returned to the traffic light application and expand our program significantly. We looked at the sequence of operation using Input, output and mask tables. The first thing that we will do is look at the HMI programming. Please refer to the following post for information on setting up and using AdvancedHMI software. Add the ModbusTCPCom control and set the IP Address. 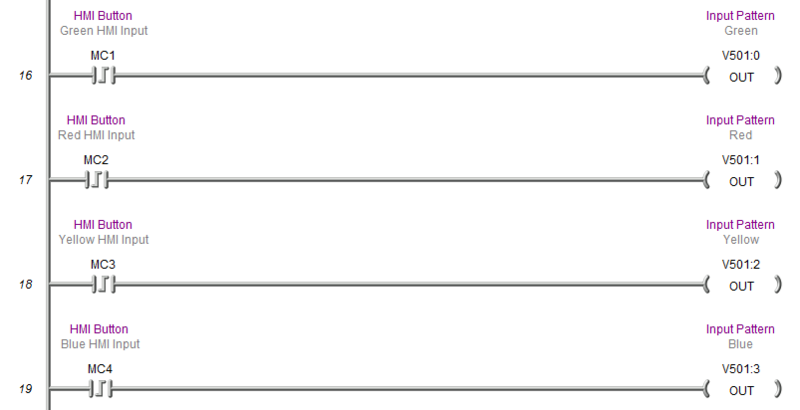 Also set the PollRateOverride to 50 so the response to our PLC is quicker. 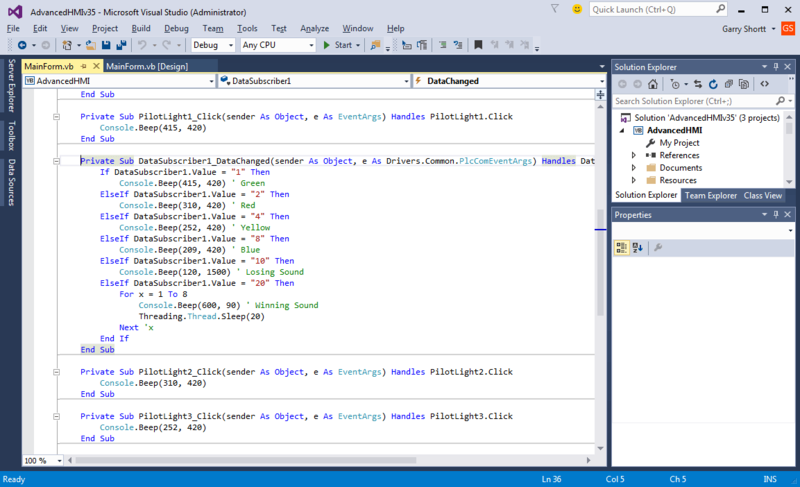 The DataSubsciber is used to read information from the PLC and manipulate the data in the visual basic code. We will use this to determine what sounds to play. 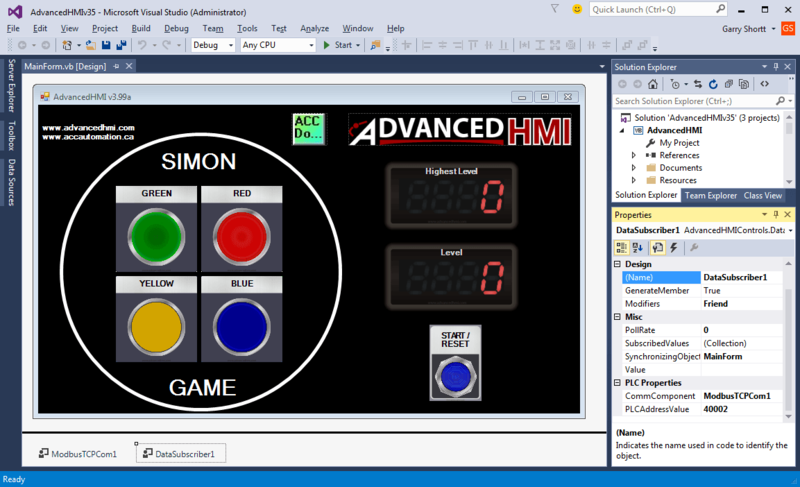 We now have our HMI interface complete and can move onto the PLC programming. 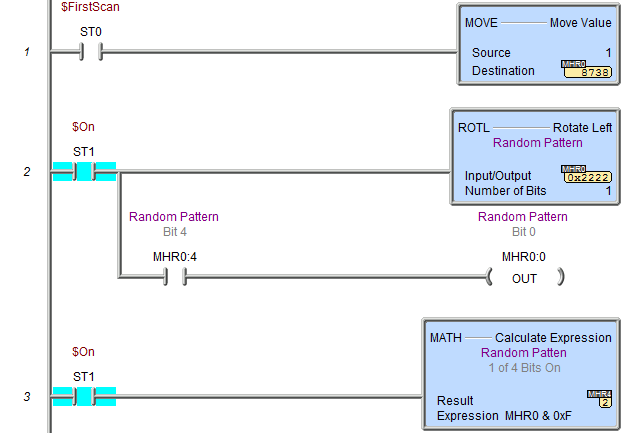 The first four bits of MHR4 will be used to generate the random sequence for each step of the pattern. The first scan is to set (1) a bit in MHR0. This will also ensure that the rest of the bits in the word are reset (0). The second rung will shift the bits left in the output word MHR0. This will happen once per scan of the PLC. When bit 04 turns on then bit 00 will then be turned on again. This way we will always have one of the first four bits turned on in the output word. 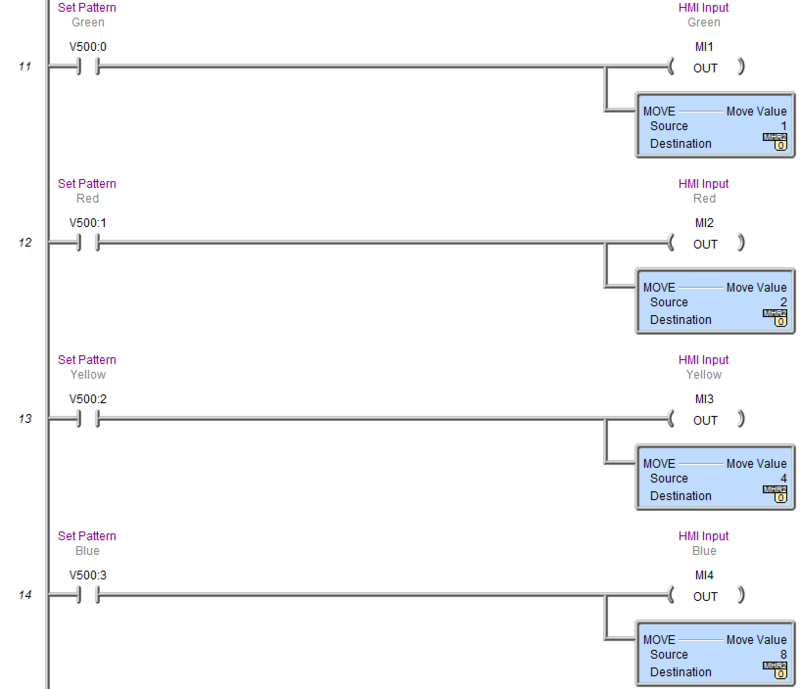 (00, 01, 02 or 03) MHR0 is logically AND with Hex value 000F and the result is placed in MHR4. All of the registers and pointers are reset to start the game. The random sequence MHR5 is moved indirectly into the Current Level Pointer V0 and this pointer is then incremented by 1. An initialization bit is then set. Y0 – Game Started is used to determine if play is to continue. Set the outputs to play the sequence. Reset the sound during the playing of the sequence. Set the bits in V501 so we can compare the word. If the wrong button is hit, then play a sound and stop the game. If the correct color is selected, increment to the next random colour in the sequence. If the correct colour sequence has been entered, then the level has been completed. Start a delay to ensure that the HMI has finished playing all of the sounds. When the level is entered correctly and the time delay has expired, we will reset the play and input pointers. 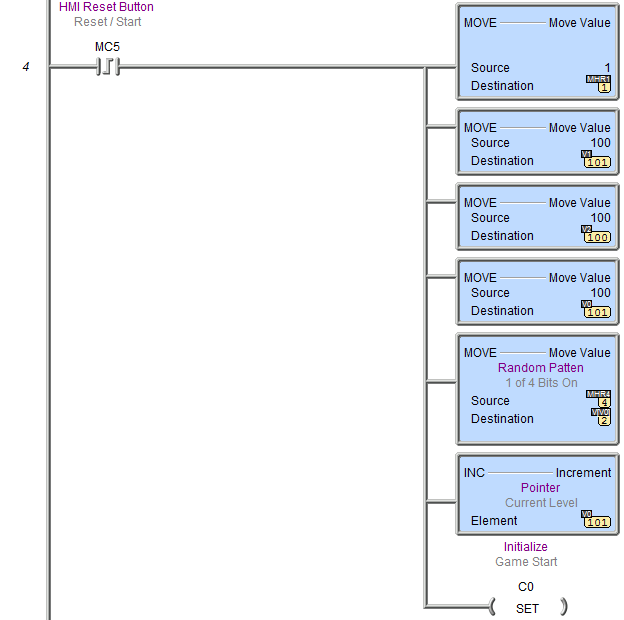 The level increases by 1 and another random number is added to the sequence and the current level pointer is incremented by 1. If the current level is greater than the highest level, the current level is moved into the highest level. If no key is hit for 45 seconds after the sequence is played a sound will be played and the game start bit will be reset. If the game start bit is off for more than 500ms, the sound will be reset. Download the PLC program and the Bin directory for the AdvancedHMI screen. 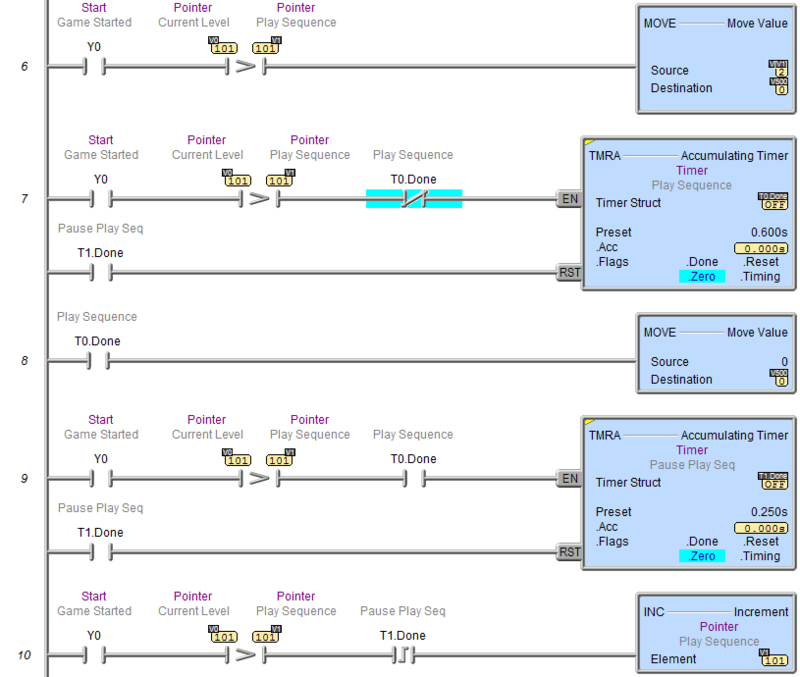 Part 6 will look at a sequencer controlling seven cylinders that can be taught. The cylinders can be operator programmed from the AdvancedHMI screen. If you need help specifically with Do-More Designer then the following link will help you out. Look for the Learn PLC Programming Free – Video Series. This will use the Do More Designer software to develop programs.